Shirts With Random Triangles: Arkansas Adds Three-Star QB Prospect Daulton Hyatt To 2017 Recruiting Class. Arkansas Adds Three-Star QB Prospect Daulton Hyatt To 2017 Recruiting Class. Daulton Hyatt. Image via scout.com. Arkansas has its third commitment for its 2017 recruiting class. Attalla, Al. high school junior quarterback Daulton Hyatt committed to the Razorbacks on Saturday. 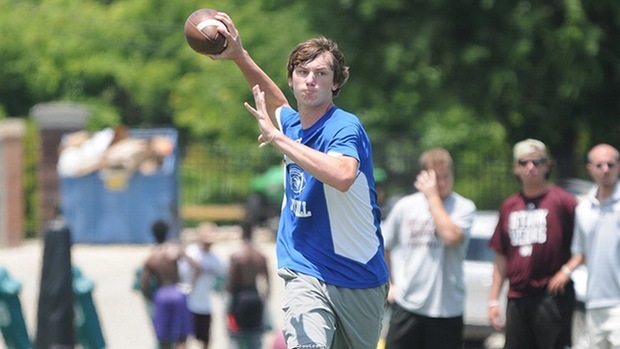 247Sports grades Hyatt as a three-star pro-style quarterback prospect. The recruiting website ranks Hyatt at no. 29 among Pro-QB prospects for 2017, at no. 27 among 2017 prospects from the state of Alabama, and at 659 among 2017 prospects nationally. Hyatt will attend Etowah High School in Attalla, Al. in the fall of 2016. He formerly attended Arab High School Arab, Al. He stands 6'4.